The ‘kwench n:gage challenge invites you to present your innovative solution for an employee engagement related conundrum. On the 18th of November, the challenge will be posted on the ‘kwench blog. You have till 24th November to send in your proposed solution. We will select the best solution and publish it on the ‘kwench blog. In addition to the instant fame you get among the top HR leadership of the country you also get shopping vouchers worth Rs 2500 to celebrate the occasion. 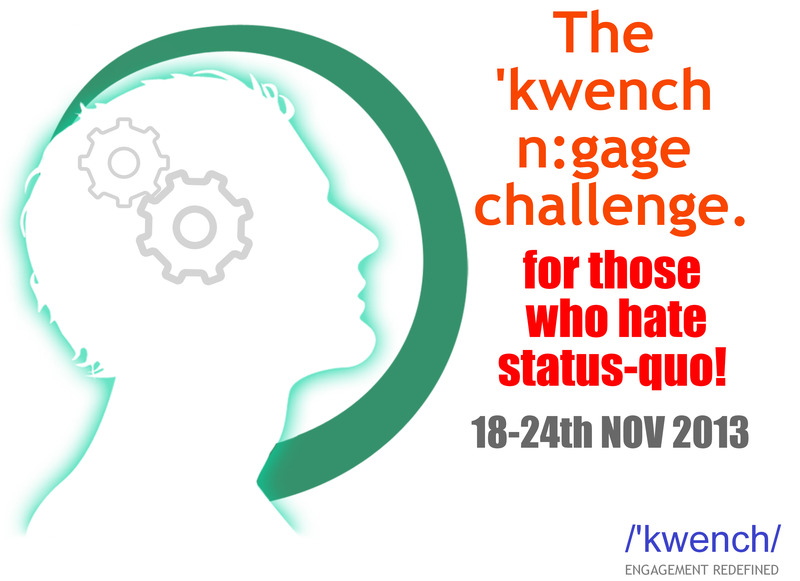 So get out your thinking hats, dust off all those cobwebs gathered around the theoretical frameworks you memorized such a long time ago or just put on your spurs and get ready to take on the ‘kwench n:gage challenge 2013.